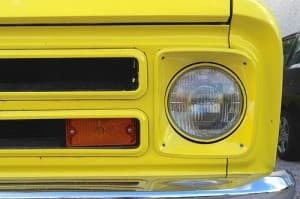 Of all of the accessories and essential parts on a pickup truck, changing or upgrading the headlights is one of the least thought of, yet those front facing lights are one of the easiest ones to improve on a vehicle. Headlight upgrades can provide you with a better light in the dark, it can save you energy while driving your pickup, it can even give it a better aesthetic look. While looking for new headlight you may be surprised as to just how many options there are. The most common of headlights are the halogen type. They have been used on trucks, cars, and vans for decades. Yet even now there are improvements being made to these old style lights. Newer versions of this kind are able to shine in different shades of color with blue being quite popular. They have also seen tailored improvements in the design to help them shine brighter. Halogen lights are often cheaper than other kinds and that makes it convenient to upgrade to a better light without necessarily putting out more money. Newer xenon bulbs one of the latest in headlight technology and especially those enhanced with an HID kit. Its bright light is making it increasingly popular with pickup truck owners. The bulbs work by using xenon gas to illuminate the headlight providing a wide variety of possible colors to display from red to blue and all in between. They use about the same amount of energy as halogen lights but they also tend to come in more attractive aesthetic styles making them popular on sporty vehicles. Last among these popular high grade headlights are LED lights. These use a number of light emitting diodes, hence the acronym LED, to produce light. They are considered to be very long lasting lights with a lifetime of at least 10 years. Some last even longer. They produce a light which has less eye glare and looks more like normal daylight than other types of headlights. This very fact is one that makes many people choose them so they can see better while driving at night. No matter how car or pickup headlight upgrades are done, they should be done to the comfort of the driver. One can pick a stylish look or stick with a classic simple design. Changing the bulb style to something better can increase to light output. Upgrading your headlights makes sense.